Taking your baby to a restaurant can be STRESSFUL. It doesn’t have to be! The trick is being prepared. Babies who are old enough to eat solids but are still immobile are pretty fun to take out to restaurants! Just as long as you’re not hovering too close to naptime or bedtime. We’ve had some…difficult…outings when my son was still a baby. But we learned a few things along the way! It’s really difficult to feed your little one with a giant spoon or a fork that will very easily poke them in the face. I would always bring 2 baby spoons so that when one gets thrown on the floor, you have a back up. Bibs are helpful too, of course. It’s a good idea to bring your own sippy cup. Even though some restaurants may provide a cup with a lid, they are definitely not spill proof! The times I was REALLY prepared, I’d whip out a disposable placemat for the baby. Pack all of the above, and you will feel like supermom. Everyone loves to eat while they’re waiting on a meal, right? Babies are no different. Pack some puffs, cereal, or mini dried fruit pieces. They take awhile to eat and keep those little hands busy while waiting for their meal to arrive. Toys are good distractions, too! Ideally, I’d browse the menu on my phone on the way to the restaurant to see what my little one might like. Don’t stress about this….but if you are a planner at heart like me, then you’ll probably do it too. When Teddy was a baby, I would politely put in his order right when we were seated. That way, he would spend less time waiting, throwing things, and trying to knock over every drink on the table. If left to his own devices, my son would start flinging butter knives, and I really rather he not, for obvious reasons. This is my favorite baby/toddler restaurant hack. Most places are willing to give you side dishes of items they have prepped and ready to go. At mexican restaurants, I’ll ask for sliced avocado and a side of rice and beans. At an American place, I order a baked or mashed potato, and plain steamed veggies. Just look at the ingredients listed in the dishes to find something your baby would like. For example, if you see a salad with hard boiled eggs, black beans, and shredded cheese, you could ask for those individual items instead of ordering the whole salad. Granted we don’t go out to eat a TON, but I’ve never had a server say no when I asked for something like that for my son. Breakfast is typically the easiest since you can always find things like oatmeal, scrambled eggs, yogurt, pancakes, or fruit. As long as you’re not having something like steak, raw crunchy veggies, nuts, etc., let your little one sample whatever you’re having. As a baby, my son ALWAYS preferred food from my plate, even if he had his own in front of him. Take it as a chance to model good eating for them (assuming you’re having a healthy choice, and not a giant plate of nachos ;). You may even decide to do this in lieu of ordering them their own food, especially if they are just starting solids or don’t have a huge appetite. 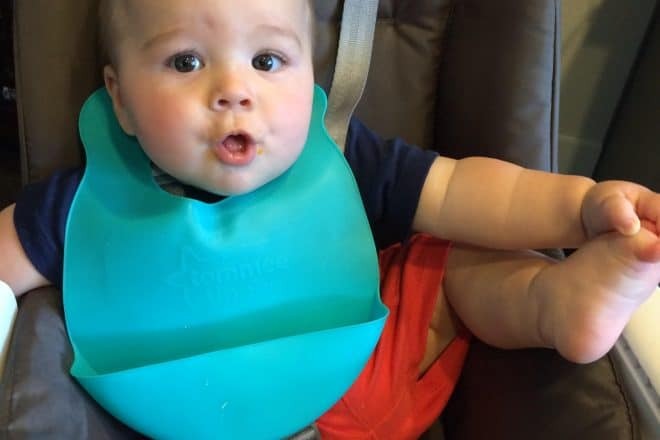 When Teddy was first learning to drink from a straw, we’d have lots of fun at the restaurant when I would stop up a little water in the end of my straw (holding my finger over the top), then place it in his mouth to get a sip. It’s a good way to practice, and when they’re first learning, they think it’s pretty entertaining! I hate to end with this sad-but-true reality — but sometimes baby just doesn’t want to be there, doesn’t want to eat, doesn’t want to sit still, doesn’t want to be quiet. It just happens sometimes. I try to go in with low expectations and know that I can always get our meals boxed up to go. It still means you didn’t have to be the one cooking or cleaning in the kitchen, and you got some time out of the house. Do you (or did you) take your baby out to restaurants? What are your go-to tips and tricks for taking your baby to a restaurant?